Widerstand gegen die Monster unserer Zeit: Trump, Faschismus, und Klimawandel. Antikapitalistischer Kongress 2017. Marx is Muss. Resist the Monsters of our Time: Trump, Fascism, and Climate Change. Anti-Capitalist Congress 2017. Marx is Necessary. This pamphlet is advertising the annual Anti-Capitalist Congress in Vienna. The cover features an infuriated Donald Trump superimposed over a group of protesters. On the inside of the pamphlet is a schedule of events throughout the gathering that includes a number of open discussions and keynote speakers on matters ranging from fascism to Islamophobia to the election of Donald Trump. 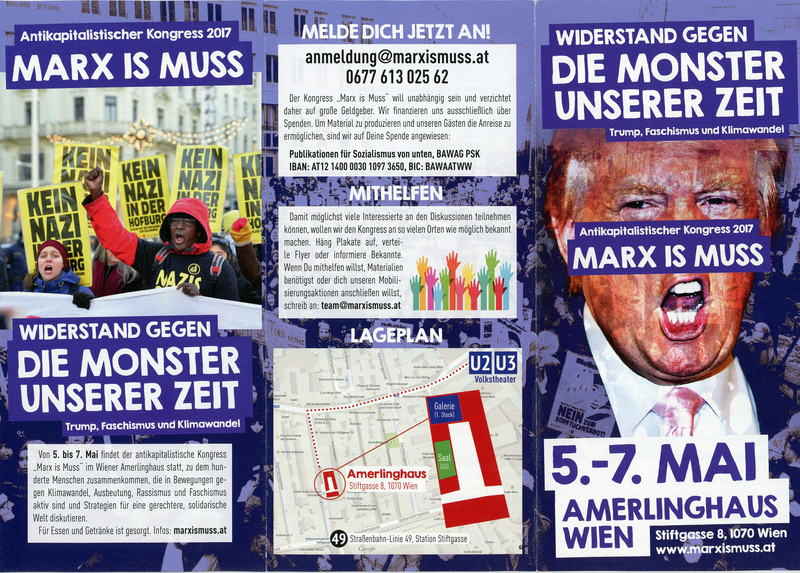 Alongside the event calendar for the Congress, the pamphlet also features images of previous demonstrations and bios of the weekend’s keynote speakers, all of which provide unique perspectives on sociopolitical issues being faced in Vienna at this time. According to the David Albrich of Linkswende (Left Turn), “As ridiculous as the new U.S. President Donald Trump may seem, his policy is real and dangerous,” warned Judith Orr of England’s Socialist Workers Party at the opening podium of the Anti-Capitalist Congress Marx is Muss on Friday, May 5, at the Amerlinghaus in Vienna. "We are experiencing the collapse of the political center [and] a crisis of the political elite and the establishment. And that leads to a polarization to the right and to the left, "said Orr in her speech. Donald Trump is an expression of this development.